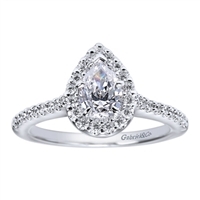 A white gold band swirls around this pear shaped diamond halo, all containing the pear shaped center diamond in this statement-making engagement ring. 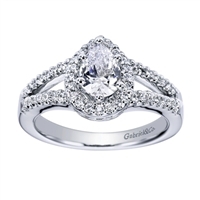 Round diamonds and white gold or platinum join together to form one spectacular contemporary halo engagement ring designed by Gabriel & Co. A round brilliant diamond halo sits alone, ready to delicately set up a round center diamond of your choice in perfectly crafted white gold or platinum in this contemporary halo engagement ring. 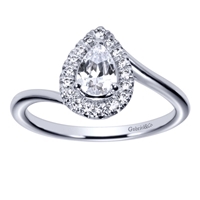 A white gold or platinum contemporary halo engagement ring shining with one quarter carat of round brilliant diamonds. 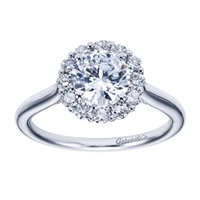 A refined and elegant take on a contemporary halo engagement ring with round brilliant diamonds supporting a round center diamond of your choice, availablle in white gold or platinum. A free form style halo diamond engagement ring made for a round center diamond sits snug in one quarter carats of round diamonds! Most won't be able to resist a double take at this unique two tone contemporary halo engagement ring complete with one quarter carats of side round brilliant diamonds. 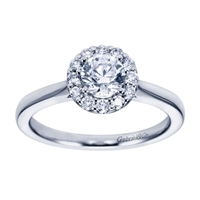 Round brilliant diamonds greet 18k white gold or platinum in this contemporary halo engagement ring. This simple and stunning diamond halo engagement ring perfectly fits a round center diamond with over one third carats in round brilliant diamonds encircling its center. Featuring a sleek metal band in your choice of 14k, 18k, or platinum. 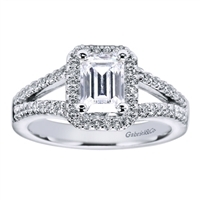 40 points in diamonds wrap perfectly around a princess cut center diamond in this white gold or platinum contemporary halo engagement ring. 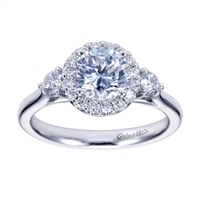 A glorious round diamond halo encapsulates a round center diamond that contrasts nicely against the smooth white gold or platinum band in this contemporary halo engagement ring. 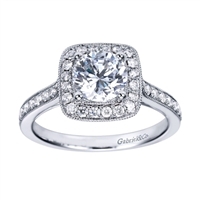 This slickly set cushion cut diamond halo engagement ring is elegant and gracefully holds in its diamond halo the cushion cut diamond of your choice. 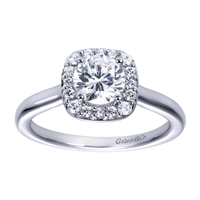 Give her a ring that shines forever with one third carats of round brilliant diamonds setting up a pear shape center diamond, she'll always be iced out in this contemporary halo engagement ring in white gold or platinum. The split band covered in round diamonds sets up the princess halo in this split shank halo engagement ring for a princess cut diamond. 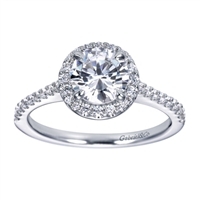 A round center diamond sits snugly in this tapered and squared off diamond halo engagement ring. A perfect fit with a twist! 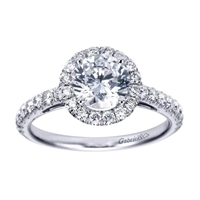 A gorgeous straight lined contemporary style princess halo engagement ring with nearly half a carat in round brilliant diamonds, designed by GAbriel & Co. A standout because of its uniqueness and elegance, this contemporary halo engagement ring for a pear shaped diamond will last in her memory and heart. A sleek band of round brilliant diamonds meets a diamond halo enshrining a princess cut center diamond in this contemporary style princess halo engagement ring. 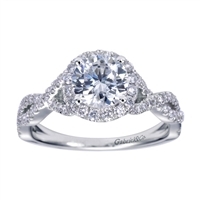 A beautiful partnership awaits between this 3 stone and round diamond halo engagement ring pairing in this contemporary halo engagement ring. 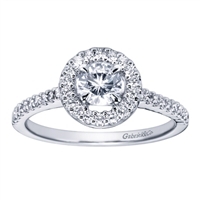 A straight band in white gold or platinum lights up the room with round brilliant diamonds all the way up towards the round diamond halo center in this gabriel and co engagement ring. A halo made for a princess! Featuring over one third carats in diamonds and a sleek and simplistic look, offered in your choice of metal. Love is in full bloom with this floral inspired white gold or platinum princess cut diamond halo engagement ring that blossoms with almost one half carat of round brilliant diamonds! 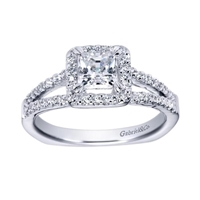 Precisely guided to the points of this contemporary halo engagement ring for an emerald cut center diamond, the twin bands of white gold or platinum are covered in a layer of round brilliant diamonds. This well designed and shimmering classic halo engagement ring holds an emerald cut center diamond in a round brilliant diamond halo . 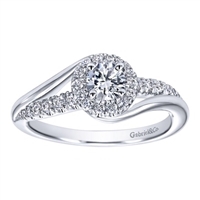 Straight bands of gold with an artistic flair join with round brilliant diamonds to create this vintage halo engagement ring by Gabriel & Co. A gorgeous double band swirling into a white gold diamond halo prominently dispalys a round center diamond of your choice in this white gold engagement ring. 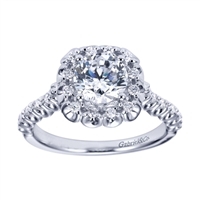 A smooth white gold or platinum band matches well with the double row of round diamonds encircling a round center diamond in this contemporary halo engagement ring.